Iceland at the Olympics is a history which began in 1912. The International Olympic Committee's official abbreviation for Iceland was ICE. It is now ISL. Iceland was first at the Olympic Games in 1912. Then they missed the next four Games. After returning in 1936, the nation has been in every Summer Olympic Games since. 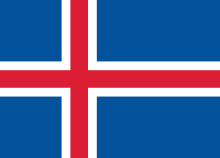 Iceland has also been in all but one Winter Olympic Games since 1948. They were not at the 1972 Winter Games. Icelandic athletes have won a total of four medals. The National Olympic Committee for Iceland was formed in 1921 and recognized by the International Olympic Committee in 1935. This page was last changed on 10 December 2018, at 19:13.